By Mark Curtis: Forty years ago last January, the Iranian revolution sent a shockwave through the Middle East, overthrowing the Western client, Shah Mohammad Reza Pahlavi, and bringing to power the Islamic regime of Ayatollah Ruhollah Khomeini. While Iran now poses the biggest challenge to Western power in the Middle East, British relations with Islamic Iran were not always so antagonistic. Britain dropped its support for the Shah before the 1979 revolution, seeking to ingratiate itself with Iranian opposition forces led by Khomeini. Once his regime was in power, Whitehall went so far as to arm it, even brutally conniving with it, seeing it as a counter to the Soviet Union. The Shah was put in power in 1953 in an Anglo-American covert operation – known as “Boot” – instigated by London, removing Iranian leader Mohammad Mosaddegh, who had nationalised British oil operations. “Our policy,” a British official later recalled, “was to get rid of Mosaddegh as soon as possible.” In fact, declassified files show that Britain’s ambassador in Tehran preferred “a dictator” who would “settle the oil question on reasonable terms”. A little known aspect of the 1953 coup is British plotting with Ayatollah Sayyed Kashani, a predecessor of Khomeini. Kashani helped fund mobs that rioted against Mosaddegh in collaboration with MI6, which had bribed army, police, political and media figures. The Shah ruled for a further quarter of a century, brutally repressing opposition through his notorious internal security service, SAVAK, which the UK helped train. 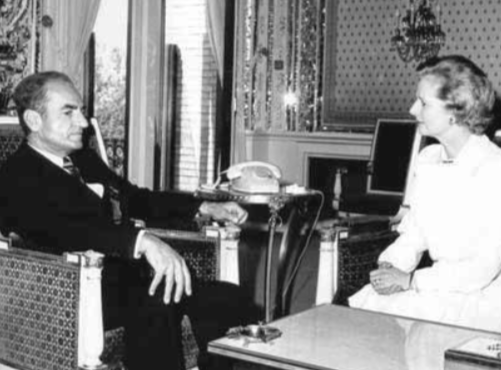 A year before the revolution, in April 1978, then Conservative opposition leader, Margaret Thatcher, visited Tehran and described the Shah as “one of the world’s most far-sighted statesmen” who had given Iran “dynamic leadership” and is “leading Iran through a twentieth century renaissance”. A few months later, James Callaghan’s Labour government secretly agreed to the Shah’s request to supply 175,000 CS gas canisters and up to 360 armoured personnel carriers to Iran to help the regime put down growing demonstrations against it. By October 1978, with unrest in Tehran threatening the regime, Callaghan wrote: “I would not give much for the Shah’s chances,” and told his foreign secretary, David Owen, to “start thinking about reinsuring”, meaning to develop contacts with opposition figures. By December, officials concluded that the Shah’s survival was unlikely and that Iran seemed on the verge of a revolution. Foreign Office officials then argued for Britain to completely switch its support to the Iranian opposition, though the declassified files do not state which figures. The Shah fled Tehran on 16 January 1979, and on 1 February, Khomeini returned from exile to Iran. Britain tried to “insure” itself further with the new Islamic regime by avoiding any association with the Shah. London and Washington both refused to allow their onetime placeman political asylum. “There was no honour in my decision,” Owen later wrote, “just the cold calculation of national interest.” He added that he considered it “a despicable act”. In February, with real power concentrated in the Council of the Islamic Revolution, dominated by fundamentalists loyal to Khomeini, Callaghan recognised the new government of Mehdi Bazargan, a scholar jailed by the Shah. Cabinet Secretary Sir John Hunt wrote to Callaghan saying that “we should lose no opportunity to foster our relationship with the new government”. Margaret Thatcher also reassured the new government that the arms ordered by the Shah, notably a massive tank deal, would continue to flow, along with “oil, trade and other interests”. Weeks later, an Islamic Republic was declared, with a new constitution reflecting the theocracy. Under the new Thatcher government, Britain continued to arm and train the new Iranian regime. By April 1980, months into the US hostage crisis, Britain was still training around 30 Iranian military officers in Britain. With Soviet invasion forces in Afghanistan, Thatcher saw Iranian theocracy as a counter to Soviet ideology. This took on brutal proportions in 1982, when Britain secretly helped the Iranian regime nearly destroy the communist Tudeh Party, the main leftist organisation in Iran. MI6, working with the CIA, passed to the Iranians a list of alleged Tudeh agents acquired from a Soviet defector, in order to curry favour with the regime and reduce Soviet influence. Dozens of Tudeh agents were subsequently executed, more than 1,000 members were arrested, and the party was banned. But Britain went still further, even as it by now regarded the Iranian revolutionary regime as a strategic threat to the West. As Iran fought Iraq in the brutal Gulf war in the 1980s, the Thatcher government armed both sides. From the very first day of the war, Britain sent millions of pounds worth of tank barrels and tank engines to Iran, helping to maintain the tanks Britain delivered to the Shah during the 1970s. Whitehall also connived with a company called Allivane International to secretly ship arms to Iran in the mid-to-late 1980s, while another project enabled the British company BMARC to export naval guns, spares and ammunition to Iran via Singapore in 1986. Around the same time, a government-owned company exported five shipments of tetryl chemicals, a compound used to make explosives, breaking both the UN embargo and Britain’s own export guidelines. The British tank exports agreed under the Shah are still plaguing relations between the two countries. Declassified files show that the new regime wrote to Britain in February 1979 repudiating six military contracts signed by the Shah for more than 1,500 British tanks worth £1.25 billion. The two countries are still haggling over the interest rate to be paid by Britain to settle a debt for the tanks that were bought by Iran but never delivered. Iran has been seeking to recover its money since 1979. The British would like to remove the Iranian regime from the Middle East, and extremists in the US and Israel are now pushing for war. But this is not 1953, and Whitehall surely realises that Iran is much stronger than Saddam Hussein’s Iraq or Muammar Gaddafi’s Libya. For now, London will continue promoting its commercial interests with Iran, while sometimes playing the side of the US in confronting it. British policy towards Iran has often been based on pure expediency. We can only wait to see if the UK ends up playing more of a restraining than supportive role over regime change in Iran. Mark Curtis is a former Research Fellow at the Royal Institute of International Affairs (Chatham House) and has been an Honorary Research Fellow at the University of Strathclyde and Visiting Research Fellow at the Institut Francais des Relations Internationales, Paris and the Deutsche Gesellschaft fur Auswartige Politik, Bonn. Mark has written six books on British foreign policies and international development.